The idea that the universe started with a big bang, including a period of inflation, is the consensus view amongst cosmologists today. However, Paul J Steinhardt and Neil Turok think differently. 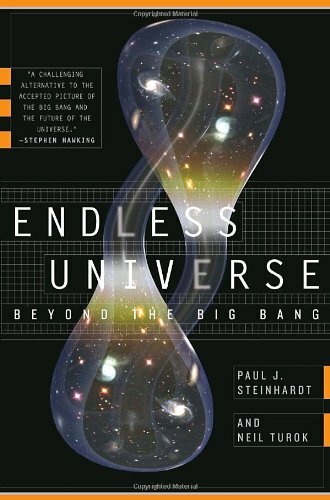 In Endless Universe: Beyond the Big Bang they describe their alternative, Ekpyrotic model. The ekpyrotic model agrees with the inflationary model for much of the life of the universe - from a fraction of a second after the big bang to the present and into the foreseeable future. The authors call this 'Act Two' of the universe and they devote quite a bit of the book to explaining it. They describe how Einstein derived the equations of general relativity, including a cosmological constant, which he called his 'biggest blunder' when the expansion of the universe was discovered. In the 1960's the Cosmological Microwave Background Radiation was discovered, and since that time the study of the details of the CMBR has been instrumental in determining the cosmology of the universe we live in, including mysterious dark matter and even more mysterious dark energy - a universal quantum field which causes the expansion of the universe to accelerate. This brings us to inflation, which is a similar phenomenon, but much greater, causing expansion by a factor of 2100000 in just 10-30 seconds. The authors discuss the Higgs-like field which is thought to be responsible for inflation, and how it needs to behave to explain the universe we see. The book isn't just about the theory of cosmology, it also has accounts of the lives of the two authors, describing how they were motivated by the space race in the 1960's and how each entered a career in theoretical particle physics. In the early 1980's Alan Guth introduced inflationary theory, and Steinhardt quickly started to work on the particle physics aspect of inflation. Turok completed his Phd in 1983 (Steinhardt was one of his Phd examiners), and started working on cosmological aspects of particle physics. As time went on they both began to feel that inflation wasn't necessarily the whole story - it seemed to need too many ad hoc assumptions. Since inflation was proposed the world of particle physics had moved on, with string theory coming to the fore, together with its hidden dimensions and branes. It was thought that these new ideas might help to solve the problems with inflation. Hence the authors became involved in 1999 in organising a series of conferences on the relationship between particle physics and cosmology. As it turned out the new ideas of string theory didn't suggest a way of improving inflationary theory to the authors, rather they suggested a way of replacing it altogether. After a talk by Burt Ovrut about colliding branes, Steinhardt and Turok realised that such a collision could result in what we consider to be the big bang. The collision creates a large release of energy, which leads to the expanding universe we see. The branes become wrinkled but as time goes on they become flattened by the expansion and matter and energy become more and more diluted. The branes move apart after the collision, but eventually they will approach each other again, and so another collision will occur. Act Two of the story of the universe may be as we have deduced, but Act One may be totally different, with a surprise in Act Three. And the story may then start all over again. The universe did not begin with the big bang - this is just one of a possibly infinite number of cycles. The authors devote a chapter to explaining why such a cyclic model doesn't necessarily 'run down' due to the second law of thermodynamics, and also consider the possibility that the laws of the universe may change from one cycle to another. The important thing to note is that this is not just an idle speculation - the ekpyrotic model agrees with current observations just as well as the inflationary big bang model. Most importantly, the authors look forward to the improvements in observations which will happen over the next few years, and should be able to decide between the two. So far the results from WMAP satellite have agreed with both models. However, the ekpyrotic model predicts a much greater contribution from gravitational waves and this should have an effect on the CMBR, with a difference in the temperature variations, and in particular a difference in the polarisation of the radiation - gravitational waves should produce a characteristic twisted pattern known as B-Mode. It is hoped that the Planck satellite, to be launched later this year, will be sufficiently sensitive to detect such a pattern, and so decide between the two models. (Of course the results might also be inconsistent with both models). It is, of course, very easy to claim disagreement with an established viewpoint, but it's a lot harder to come up with an alternative scientific idea which still agrees with the experimental evidence as Steinhardt and Turok have done. While the inflationary big bang model is still the mainstream one, this book shows that it is not the only possibility. The authors present persuasive arguments for the Ekpyrotic universe, and I felt that the book helped to move ideas such as branes out of the realm of pure speculation to become something which needs to be given serious consideration. The book is written in an easy to read style, and is not too technical. It gives an overview of many recent ideas in cosmology, and hence I'd recommend it to anyone with an interest in cosmology, as a pointer to a possible shake-up in the subject in a few years time.